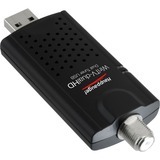 a dual digital TV tuner for your Windows PC! ATSC is free over-the-air digital HDTV standard for North America and typically requires an antenna for reception. There is no monthly fee for ATSC HD TV. Clear QAM allows users to watch unencrypted HDTV stations from cable TV without a set-top box. Clear QAM does require a cable TV subscription. Clear QAM TV is not available on all cable networks, so check with your local cable TV operator for clear QAM availability.